Due to Miss Berry's trip to Europe, the Berry Schools thank Mrs. Barnes for her generous donation. The Berry Schools also let Mrs. Barnes know that Miss Inez Wooten still works at the schools and will turn her attention to the check immediately. 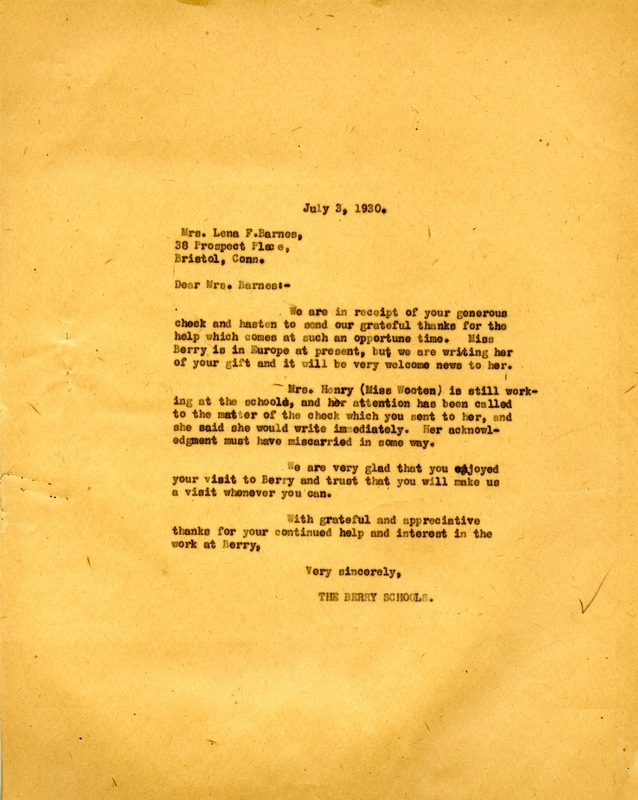 The Berry Schools, “Letter to Lena F. Barnes from the Berry Schools.” Martha Berry Digital Archive. Eds. Schlitz, Stephanie A., Meg Ratliff, et al. Mount Berry: Berry College, 2013. accessed April 21, 2019, https://mbda.berry.edu/items/show/11743.